Be the first to share your favorite memory, photo or story of Walter . This memorial page is dedicated for family, friends and future generations to celebrate the life of their loved one. Walter Terrell “Terry” Scarborough, Jr., 96, died peacefully at 10:10 p.m., Monday, January 28, 2019, with his children at his side, at the Parsons Presbyterian Manor. School in 1939 where he excelled in academics, music, football, track and in courting his high school sweetheart and future wife, Jean Borders. Prior to World War II, he attended William Jewell College in Liberty, MO for two years. He was a member of Kappa Alpha Fraternity and lettered in football and track. Many of his track records for the 100 and 220 Yard Dash at William Jewell College were not broken for over 25 years. Terry then transferred to St. Mary’s College in San Antonio, TX where he also lettered in football. He then became one of the forty-four students that entered the United States Navy Pre-Flight School at St. Mary’s College. He then attended intermediate and advanced flight training in Pensacola, FL. After graduating from the top of his class out of four-hundred pilots, he was “selected” and became commissioned a Second Lieutenant on July 16, 1943. He flew F4U’s (dive bombers) and Grumman F7F’s (night bombers) during World War II. While stationed in various Naval Air Stations in California he and Jean were married on July 31st, 1943 in LaJolla, CA. They had celebrated seventy-three years of marriage the summer prior to Jean’s death on September 29, 2016. After the war he returned to William Jewell College and graduated with an AB degree in Physics. After graduation from William Jewell he was reactivated in the Marine Corps for duty due to the Korean War. Major Scarborough flew transports and helicopters (HR’s 1,2,3 and 4’s) and commanded a helicopter squadron. After the Korean War he and Jean decided that he would remain in the Marine Corps. Terry loved to fly and even though they made seventeen moves and there were months at a time when he was on duty away from the family, it was a life the entire family enjoyed, loved and were enriched by the experiences. His children all agreed that being a “military brat” was a good life! After retirement from the Marine Corps, in 1968, Terry accepted a position with the US Gypsum Corporation to be Director of New Projects and Services and Transportation Director at the Army Ammunition Plant in Parsons, KS. He and Jean made many lifelong and dear friends through his work. 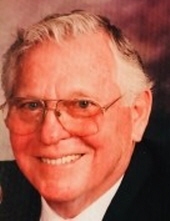 He loved the game of golf and enjoyed league play at the Katy Golf Club where he was a member. He and Jean were faithful members of St. John Episcopal Church for over fifty years. He always had a committed love for Jesus Christ as his Savior and lived a life of a strong and steadfast faith. He served on the church’s Vestry as Senior Warden many times. He as a member of the Elks Lodge, spent many years in his retirement volunteering at St. Vincent de Paul’s Thrift Shop and was a Gold Member of the Veterans of Foreign Wars. Above all it was his family that gave him the most joy! He always showed an unwavering and devoted love and loyalty to his family. He is survived by his children, Terri Scarborough, Jane (Les) Stringer and Mike (Candy) Scarborough of Parsons; grandson, Chris (Ronni) Stringer of Parsons and seven granddaughters, Kelly (Tim) Dean, Rebecca (Jimmy) Powell and Amy (Bobby) Loft, all of Ocean Isle, NC, Jill (Steve) Allred of Ash Grove, MO, Gina Scarborough and Sara Carson of Parsons, Elisabeth (Joe) Renfro of Seneca, MO; fourteen great-grandchildren and five great-great-grandchildren. He was preceded in death by his wife, Jean; his parents, Walter Terrell, Sr. and Beulah Mae Scarborough, a grandson, Gavin Carson, sister, Joy Crouch and brother-in-law, A.J. Crouch and nephew, Timothy J. Crouch. The service will be at 2 p.m., Friday, February 8 at St. John’s Episcopal Church with the Reverend Sharon Billman, Vicar, officiating. Burial will follow at Memorial Lawn Cemetery, with military honors given by the Brown-Bishop Post # 704, Veterans of Foreign Wars. There will be no visitation. Memorials are suggested to the St. Elizabeth’s Altar Guild at St. John’s Church. They may be left at the church during the offertory or sent to the Carson-Wall Funeral Home at Box 942, Parsons, KS 67357. Online messages may be left at www.wallfuneralservices.com. To send flowers or a remembrance gift to the family of Walter Terrell Scarborough, please visit our Tribute Store. "Email Address" would like to share the life celebration of Walter Terrell Scarborough. Click on the "link" to go to share a favorite memory or leave a condolence message for the family.